A small church with an imposing tower visible from the port. 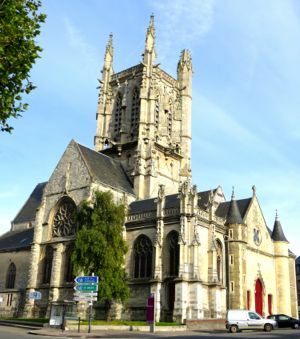 The Church of St-Étienne (Saint Stephen) has had a long and difficult history, but it has remained the church most associated with the maritime population of Fécamp. The parish existed as early as 1006, and it has always served the fishermen, sailors, and their families. Overlooking the port, its distinctive square tower is visible throughout the town. 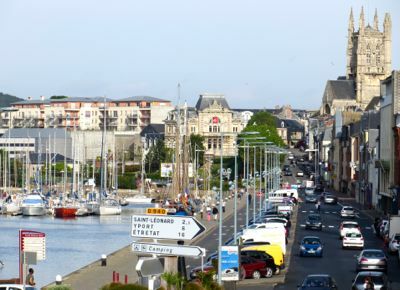 Above, Tower of St-Étienne, near the port of Fécamp. In the 16th century a new, larger church was planned. Lack of funds and leadership, and a subsequent fire, meant that the church was never finished as planned. For centuries it was incomplete, and risked demolition after the French Revolution. It was, however, saved by the faithful sailors it served, and rebuilt in the 19th century. Fécamp sailors who have died at sea are memorialized at the Chapelle Notre-Dame de Salut, on Cap Fagnet, across the port from St-Etienne. Above, Church of St-Étienne, Fécamp.